Mexican actress, Stephanie Sigman was never much for the horror genre growing up. “I never gravitated towards scary movies. I would watch the occasional one here and there, but I wasn’t a huge fanatic,” said Sigman during a phone interview with Lawndale Bilingual Newspaper. “I don’t like being scared.” Fast forward several years later and Sigman is now starring as Sister Charlotte the lead in what promises to be another global phenomena “Annabelle: Creation.” “You can see the irony,” laughed Sigman. Similar to her choices working on projects like “Narcos,” “SWAT,” “American Crime,” and “The Bridge,” Sigman followed her intuition when she read the script. “I don’t think it is coincidence that I play intense roles,” said Sigman. “I have so much passion for my craft and in everything I do that roles, such as Sister Charlotte are wonderful to play because they are multi-dimensional. That is extremely important for me when I play a character.” Sigman assured that Sister Charlotte is not the usual stereotypical nuns we have watched onscreen. “There are layers to her. Her first priority is to protect the children because she is their mother. She brings hope. She brings compassion. And, of course, she brings on the screams.” Sigman went on to describe the scares she encountered on the Warner Bros. lot where most of the film was shot. “You know, it was surreal. Obviously we are on set playing characters, but there were certain scenarios, without giving anything away, that caused quite a frenzy. There were moments where I genuinely forgot I was playing a character. That’s how scary some of the scenes were,” said Sigman. 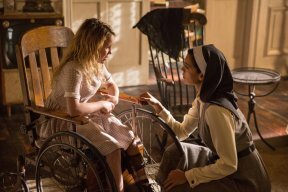 In “Annabelle: Creation,” several years after the tragic death of their little girl, a doll maker and his wife welcome a nun and six girls from a shuttered orphanage into their home. They soon become the target of the doll maker’s possessed creation, Annabelle. The new film is once again produced by Peter Safran and James Wan of “The Conjuring” movies. 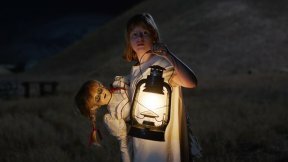 The movie will take audiences around the world to the very origin of Annabelle in “Annabelle: Creation,” which is set to his theaters on August 11th. “This movie truly delivers the scares and we hope movie goers enjoy the film as much as we enjoyed making it,” concluded Sigman.